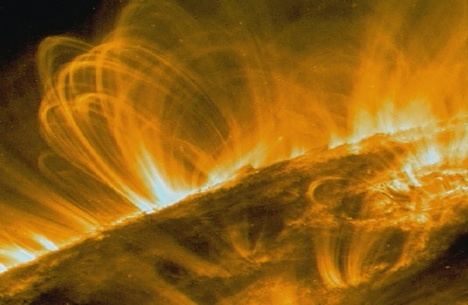 Researcher Mitch Battros on 11/26/2012 discussed solar flares, climate change, and the Earth’s core and magnetic field. There’s something going on that no one can quite put their finger on, he commented– flares rated as an M1 or M5 seem to have the higher impact of an X flare. “That correlation is transferring to the Earth’s core and that’s what’s causing these earth changing events such as earthquakes and volcanoes, including hurricanes and extreme weather of all types,” he said. During the last two years, a stream of charged particles emitted from the center of the galaxy has been affecting our sun, and in turn the Earth and its core, he added. He spoke about the effects of the weakening of Earth’s magnetic field– one possible scenario from this would be the extinction of various species, starting with migratory birds. This weakening allows for an increase of charged particles (radiation) from cosmic rays, gamma rays, and CMEs (coronal mass ejections) and solar flares to hit the Earth. However, what we are witnessing are natural cyclical events which our planet has seen many times before, and was observed by ancient peoples, he pointed out. Battros also touched on such topics as glacier activity, supervolcano calderas, and solar filaments. For more, check out a graphic he sent us.